of a person, group, etc., is revealed or identified. captures a defining moment for me. It reveals the essence of who I am. of years before (thank you Title 9). I wanted to take in the fun of senior year. I left my musical instruments and dawned a flag for the school color guard. I could be better prepared for college engineering classes. 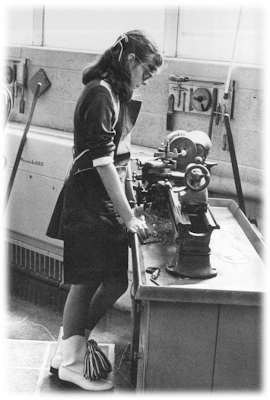 I was the first female student to work a lathe in that school. this day and started working on my project. I had no idea that this photo was taken until yearbook came out. It is one of my favorite photos - it gets me. Wonderful photo! It's very powerful. What a year in your life, the beginning of something great! I'm glad that picture was taken. :) Thank you for sharing!! The picture you have shared is inspiring. It is an amazing photo. I too am an engineer and I so get this photo! What a Treasure to have a moment captured like that. Thank you for sharing. Thank you for sharing your defining moment...the Lord blessed you with great honor and amazing abilities! I'm here via the Blog guidebook and my blog is Bargain Hoot. Hi! I’m belatedly stopping by from the UBP. Nice to meet you!